Read the inside stories behind the making of one of the best comedies ever. These fun facts about Caddyshack will have your remembering one of the funniest movies of all time. On July 25, 1980, Orion Pictures and Warner Bros. studios released Caddyshack to mixed reviews and modest opening-weekend box office numbers. In the intervening years, Caddyshack has gained a cult following and is largely regarded as the funniest sports film of all-time. The movie starred comedic heavyweights Chevy Chase and Bill Murray, and helped catapult the film career of Rodney Dangerfield. Caddyshack was Harold Ramis’ directorial debut. It was co-written by Ramis, producer Douglas Kenney, and Bill Murray’s brother, Brian Doyle-Murray. Caddyshack finished 1980 as the 17th highest-grossing film of the year, netting nearly $40 million. (No. 1 that year was The Empire Strikes Back with $209 million). It’s now among the most beloved comedies ever, and, as one would imagine, it’s a favorite among professional golfers. 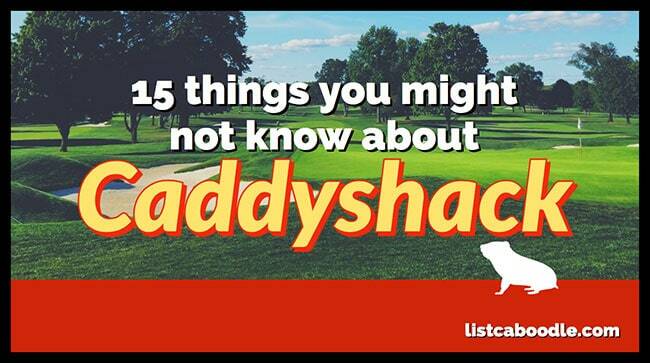 Here are 15 facts you might not know about Caddyshack. Harold Ramis co-wrote Animal House and the National Lampoon comedy soon became a classic. The frat-house film turned a $3 million budget into a $141 million return at the box office. So when Ramis and co-writer/producer Douglas Kenney pitched their next set of ideas to Orion Pictures, it came as a surprise that they were all rejected. However, when Kenney and Brian Doyle-Murray pitched a new film as “Animal House on a golf course,” it was immediately given the go-ahead by the studio. One of the stipulations from Orion Pictures for Caddyshack was that the film needed an A-list star to headline. Co-writer/producer Doug Kenney, founding editor of National Lampoon, turned to longtime friend Chevy Chase, a Saturday Night Live alum and legitimate Hollywood talent. Chase agreed to the film in part because he enjoyed the thought of mocking golf as a sport. Little did he know at the time, Ty Webb, his role in the picture, was written with him in mind by Ramis, Kenney and Doyle-Murray. Ramis was slated to make his directorial debut with the film and casting was a mystery to him. The character of Al Czervik was a wealthy, insult-hurling foul mouth, so naturally, Ramis and co. wanted Don Rickles for the part. But thanks to a series of successful appearances on The Tonight Show in 1979, standup comedian Rodney Dangerfield was given an audition and blew the team away. The film would launch Dangerfield’s movie career, though he was never comfortable on set because the crew could never laugh at his jokes during filming. One of the iconic characters from the comedy, Judge Elihu Smails, was played by longtime TV star Ted Knight. Best known for his time on The Mary Tyler Moore Show, Knight signed on with the hopes of breaking out of the mold he’d cast for himself. Unbeknownst to most at the time, Knight was diagnosed with cancer shortly after The Mary Tyler Moore Show ended in 1977. Knight was dealing with the cancer throughout the filming of Caddyshack in 1979. Knight went back to TV acting after the film. He passed away in 1986. The final two actors up for the role of Danny Noonan, a goofy boy-next-door type, were Mickey Rourke and Michael O’Keefe. Rourke’s magnetism and good-looks kept him in the running for the part, but he was ultimately dismissed because he was seen as too intense. O’Keefe helped himself in the audition by claiming he was a scratch golfer. In his audition with Ramis, Michael O’Keefe claimed to be a scratch golfer. That was a plus, considering the film was centered around the sport. Thing was, he didn’t really know how to play. So, after landing the part of Danny Noonan, O’Keefe’s father arranged for his son to take lessons from the club pro at the Winged Foot Golf Club in New York City. O’Keefe played golf every day for six weeks ahead of filming and made himself a passable player. With all the main parts for the film filled, Ramis and company were ready to start production when Orion Pictures insisted on a project having a fourth major star to join Chase, Dangerfield and Knight. Ramis, Kenney and Doyle-Murray immediately proffered Doyle-Murray’s little brother, Bill Murray. The problem was, Murray’s part didn’t exist in the script. They agreed on a salary and a schedule for Murray well before any lines were ever put down for him. While the film itself was filmed over an 11-week span, Bill Murray’s role was conceived, written and shot over the course of six days. Murray had a large part in developing his character, Carl Spackler, and Ramis, Kenney and Doyle-Murray all relied on Bill’s improvisational talent to carry the days. Their confidence is Murray was so much so that Ramis left huge gaps in the shooting script for Bill to fill in later. One of the drawbacks to the improvisational nature of Murray’s performance was its unpredictability. The Dalai Lama monologue was meant to be only a cameo for Murray, but Peter Berkrot, Murray’s costar in the scene, said the scene took seven hours to film. Conversely, Murray’s “Cinderella Story” scene, which features one of the most memorable lines from the movie, was filmed in one unbroken take and was completely improvised from two lines of stage direction. Much had been made of Bill Murray and Chevy Chase’s rivalry, dating back to their Saturday Night Live days. As the story goes, a fight broke out between the two when Chase went back to SNL as a guest host while Murray was still on the cast. So, when the studio insisted that Ramis take advantage of the talent he had at his disposal, the crew was doubtful. Ramis, Murray and Chase planned the scene over a lunch break, then filmed that evening. The scene was completely improvised, not a word existing in the script. Chase credits it for melting the icy tension between the two stars. When the story for the film was originally conceived, it was largely based on the childhood experiences of Doyle-Murray and Ramis as caddies back in their home state of Illinois. They wanted to film in Illinois, but the studio wanted a Summer 1980 release, which eliminated the cold weather state from a Fall 1979 shooting. Orion Pictures posited a location in Los Angeles, but Ramis wanted to avoid the prying eyes of studio executives. So, a location about a half-hour north of Miami, Florida, was chosen. One of the hazards of living and working in Florida in the summer is hurricane season. Sure enough, in August of 1979, Hurricane David ripped through the Caribbean and the US. The category two storm skirted along the east coast of Florida and caused some $1.5 billion in damages in the area around Davie, Florida, where the Rolling Hills Golf Club was. Hurricane David ruined several of the Rolling Hills sets and completed flooded the on-site production offices. With all of the comedic talent at work, it’s no wonder that the first cut of the film was well over four hours long. Large gaps in the script and largely improvised stretches in the movie added to the plot. So Ramis and company decided to shift the focus of the film to the stars, lessening the roles of some of the other characters, much to the chagrin of actors like Michael O’Keefe and Ted Knight. Part of the solution also included increasing the role of the gopher. Movies in the 80s all seem to have a catchy song or theme associated with it, and Caddyshack is no exception. Although Kenny Loggins eventually wrote the famous theme song for the film, director Harold Ramis originally wanted Pink Floyd to write the music for his film. Pink Floyd, fresh of the release of The Wall, declined the offer and the job eventually went to Loggins, whose song “I’m Alright” headlined the soundtrack. Loggins would have another soundtrack smash hit in the future with “Danger Zone” for the Top Gun in 1986. Caddyshack is largely held as the funniest sports film of all time, and it’s certainly a favorite among professional golfers. Tiger Woods has said that Caddyshack is his favorite film of all-time. Woods demonstrated his love for the film when he played Carl Spackler, Bill Murray’s character, for an American Express commercial. The commercial featured references to a number of the famous scenes from the movie, including the “Cinderella Story” moment. You buy a hat like this, I bet you get a free bowl of soup. He’s a Cinderella story. A former assistant groundskeeper about to become the Masters champion. It looks like a mirac – It’s in the hole… It’s in the hole! It’s in the hole! In order to conquer an animal, I have to think like an animal, and whenever possible, look like one. You’re on Fun Facts about CaddyShack.